However, executing an effective content marketing program is no simple task. It requires a skilled team and a well-run process. To help you build and operate an elite team of editors, strategists, writers, videographers, and designers, follow these tips curated from 13 marketing experts. Creating a content marketing strategy isn’t a superfluous exercise to kill time. Your strategy is the DNA for how your brand communicates with the outside world. It’s also the genetic code necessary to build the best team to execute the strategy. To function efficiently, it’s important to have clearly defined job roles and a formal structure for your team. Without this, responsibilities get blurred and chaos usually ensues. With a team of editors, designers, and writers, you need a leader. This is typically your managing editor or content strategist, who is responsible for keeping the team in alignment with the growth goals of the organization. Your editor is the linchpin of your content marketing operation – you want to choose him or her carefully. Find someone who pays meticulous attention to detail, is highly organized, can work to a deadline, and is a good copywriter – so the editor can improve upon (rather than destroy) the work of your other writers. Large egos and editing don’t go together well. Ensure that your editor can look at things objectively and provide criticism without tearing down the work of other writers. Content creation can become an insular process. When you spend all of your time researching topics, writing informative articles, and promoting content, it’s easy to lose track of the bigger picture of how content marketing is moving the company forward. When hiring a strategist, look for someone who understands good content and pays attention to detail but who has a strong vision for the future and is prepared to go the extra mile to ensure that your goals become a reality. HANDPICKED RELATED CONTENT: What Should Marketers Look for in a Content Strategist? While writers may be the most fundamental members of your content team, remember 65% of people are visual learners. Don’t neglect the importance of visual content creators. Facebook posts with images generate 2.3 times more engagement than those without, while tweets with images generate 150% more retweets than those without. It’s crucial that your team is able to create high quality images that resonate with two-thirds of your audience. When hiring a writer, the quality of the person’s work should be more important than their background or qualifications. That said, journalists usually have an innate ability to investigate an issue from all perspectives and write in a way that communicates rather than simply expresses. For this reason, a journalistic background is a great asset for a writer on your content marketing team. Often, a skilled writer is more valuable than one who is knowledgeable about a particular subject. That’s why you can actively look for writer candidates from all types of content places. Unless you’re producing content which is extremely technical or requires deep domain knowledge, judge potential hires on the quality of their portfolio rather than what topics they’ve written about. Cisco estimates video will make up 80% of all internet traffic by 2019. If you can regularly produce high quality video content without breaking your marketing budget, you’ll benefit greatly. You don’t need to hire a full-time videographer or animator. You can start with the help of freelance animators, script writers, designers, voice actors, and spokespersons thanks to resources like Fiverr and Upwork. Writers are not equal in their strengths and weaknesses. Some writers are great at turning out highly technical blog posts, but struggle at scripting humorous animated explainer videos. Likewise, reaching out to influencers and arranging expert influencers comes naturally for some content marketing team members, while others prefer to stick to content. The key is to have a diverse set of skills on your team so you can handle the full spectrum of content marketing activities. In my experience, it can be helpful to hire freelancers for individual projects rather than hire full-time staff — that makes it easier to match the right skill set to the right project. HANDPICKED RELATED CONTENT: Who Would You Add to Your Content Marketing Team? No one wants to work for a company where their skills aren’t valued. In your job description, be sure to emphasize that you’re looking for someone who can grow with the organization. Promoting internally is less expensive and creates excellent organizational loyalty. If you’re prepared to invest in team members’ growth, they are more likely to want to stay with you for the long term. Without solid documentation, attempts to scale your content marketing will result in mayhem. Experienced content team members are the best people to document working processes. As they ascend to senior positions, they’ll be available to clarify the documents and answer questions when new members join the team. Nothing is worse than a disjointed tone of voice that varies from one platform to the next. When you’re scaling a content team and bringing on new writers, it’s essential to have a style guide. A documented tone of voice, vocabulary list, and communication style enables every content creator on your team to represent the brand with integrity. It’s useful to document your style guide and work processes, but it’s also important for new hires to learn through real-time communication. Gary isn’t a fan of remote working arrangements and likes to inculcate employees into his culture via face-to-face interactions. However, even if your content team is composed of freelancers scattered around the world (like mine is), videoconferencing can allow for regular face-to-face communication. You get to know someone far better when you can hear their voice and see their face. 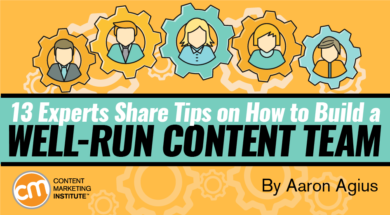 Can you think of any other tips for building a content team? Please let me know in the comments. Help your content marketing team improve their skills and stay on top of the latest opportunities. Encourage them to subscribe to CMI’s free daily or weekly digest newsletter.